Negotiations with Stacey continue but I do have a photo to post from Sunday that isn't in review. 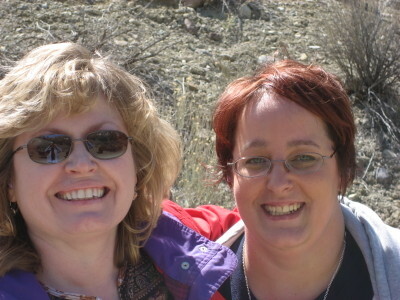 Two pretty happy knitting (and shooting) bloggers. My brother hosted us on his land in the mountains. As a firearms instructor, he does a lot of shooting and we did some target practice on Sunday. I guess Stacey enjoyed it. I enjoyed it. It is great when you can hit the target. I think it important to be familiar with firearms and not be afraid of a tool. Firearms are tools. That's it, folks. Tools. Today I'm in San Diego. 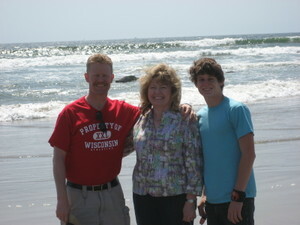 My eldest nephew attends UC-San Diego and we hooked up with him for dinner this evening. Tomorrow, we will get the campus tour, take a tour of the harbor, and perhaps check out some of the museums. 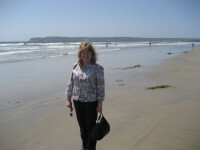 This afternoon we viewed the Hotel Del Coronado and walked on the beach. It was a bit cool by California standards but compared to Wisconsin, I thought it was great. The hotel is a historic treasure and a beautiful hotel. It just radiates atmosphere and I'm sure the building has many stories to tell. Tonight we are just hanging at the hotel with a few beverages and snacks on the balcony overlooking the water. Vacation. Ahhhh. Doves. 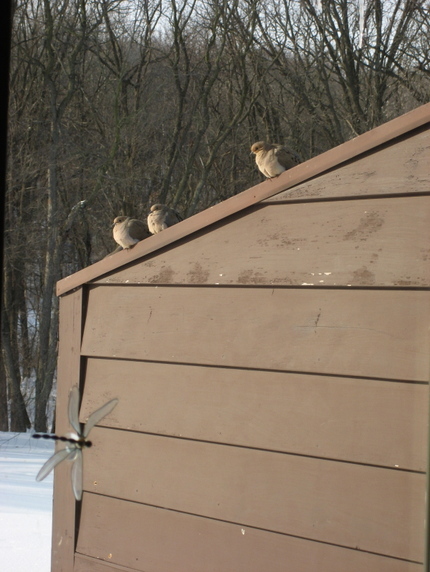 Mourning doves, that is, as seen through my kitchen window this morning. In addition to our ever-present squirrels, mourning doves are constant backyard companions. They roost in the woods and visit the feeders through out the day. D is also for the dragonfly window decoration. 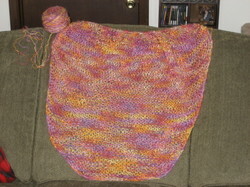 As of this afternoon, the Spring Enticement Shawl is off the circular needle. It is blocking right now. Once it dries, I'll add the fringe and have a finished object. For current works in progress, I have to cast on for sock number two of the Jaywalkers and I also have Williamsro, which is still on sleeve number one. Catching up? I'm running a couple days behind for the "C" entry for the ABC-Along but I'm catching up today with this entry. C is for Coffee. DH and I drink it every day...yes, we're addicted. I consume about two cups and I'm happy but one will do if I'm busy and don't fill my cup a second time. I now drink it black but I miss having sweet creamy coffee. I just use those calories somewhere else. 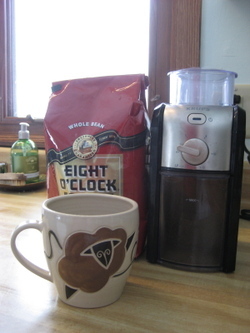 We've graduated to a burr grinder, which does produce a more uniform grind. (Thanks to Vicki and Ann for making me aware of burr grinders.) We also perk our coffee on our stove top but we may soon go back to the drip method. I burned the coffee today. I was busy with putting away laundry in another part of the house and forgot I had the coffee on. I heard this weird noise and came running, thinking the washer was overflowing. Nope, just the coffee pot boiling all over. So, I'm washing the kitchen rugs today for good measure. (And I used the dreaded mop.) Any suggestions of a favorite drip coffee machine? (Apologies to Stacey for my topic today.) Mug from Jennie the Potter. Oh, we also tend to stick with the coffee beans in the red bag, especially now that our Piggly Wiggly carries them consistently. We must reward appropriate actions! 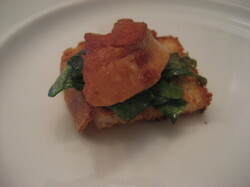 C could also be for chicken on toast tapas since that is what DH made for dinner last night. 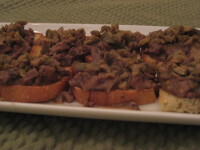 We had chicken livers chopped and cooked in a yummy sauce with chopped green olives on top. He also made teriyaki chicken on chopped arugula. Yum. Mom's air travel finished yesterday about midnight with her in a hotel room in Green Bay, Wisconsin. She traveled from LAX to Detroit to Minneapolis then BACK to Detroit then finally to Green Bay. Northwest canceled all their flights to Appleton so we were very lucky her rescheduled flight plans took her to Green Bay. Otherwise, she would have been spending two days in Detroit waiting for a flight (at her expense). I'm still tired from all her traveling, I cannot imagine how she felt last night. I hope today is better with some good sleep behind her. My uncle is going to pick her up today in Green Bay and take her home. Whew. The roads are still really horrible here and it is still snowing. DH had a dental appointment this morning and said Highway 51 had about 3 inches of snow on it and Highway 22 had 4 inches while our country roads had 4 to 5 inches. At least there doesn't appear to be as much ice under the snow as we feared. Our trees are covered in ice and some are drooping in ways trees normally don't bend. I have the day off and I'm not going anywhere. 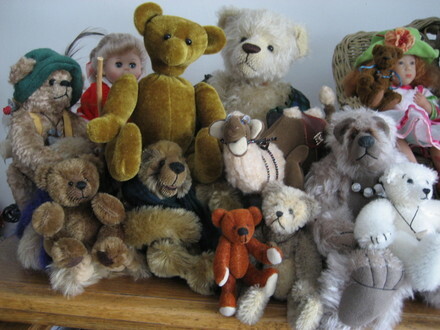 Here are most of the bears gathered with a few friends for a group photo. A few bears were just too busy to join us for the photo. I fell in love with artist-made bears about ten years or so ago. My friend, Charlynn, was all ready addicted to bears and I put up very little resistance to going to several bear shows in the Chicago area. The originality and skill that goes into the artist-made bears is incredible and you appreciate it all the more when you make (or try to make) one yourself. I made three four of the bears in this group. The little bear in the lower left is from a kit I purchased from Pam Holton. I sewed him while on a vacation to the Upper Pennisula. EO Bear, the mustard colored bear with no nose or mouth, is my first bear and hand-sewn. I was contemplating how to proceed with the nose and mouth when we started house-hunting and buying......so he was put aside for a few years. Yes, Stacey, I'll give him some more facial features soon. The third bear is Jason Bigfoot, the little cinnamon bear in the front. He is hand-sewn from my own pattern and his name is very telling. *g* Actually, there is a fourth bear I made in this photo! I took a class from Pam Holton and the White Bear on the right was made in class. I think the parts were sewn together for us and we just made the face, stuffed the parts and joined the bear. I don't worry about my yarn stash much since I had a stash of mohair fabric and bear eyes as a primer.